The University Libraries is very pleased to announce its first lecture of the fall 2018 STEM Speaker Series presented by Dr. Heather J. Lynch from the Department of Ecology and Evolution. Sub-meter resolution satellite imagery is a transformational technology that radically expands our ability to study the spatial ecology of colonial seabirds. Sub-meter mapping of Antarctic penguin colonies at continental scales provides a window into the relative importance of biotic and abiotic factors in structuring the fine-scale spatial ecology of seabird colonies (biological process) and the within-colony dynamics driving habitat occupancy at regional scales (geographic pattern). These data have already contributed a number of important insights into penguin biology, have led to the first global population surveys of a number of penguin species, and have provided the raw data with which to track populations at spatial scales relevant to Southern Ocean fisheries management. On the other hand, the volume of information now available for many Antarctic species poses some unexpected ‘big-data’ challenges. Dr. Lynch will discuss advances in data analysis that allow us to integrate multiple streams of data in a spatial explicit way that is easily scaled from individual breeding populations to biologically-relevant meta-populations to areas of interest for the management of Southern Ocean fisheries. 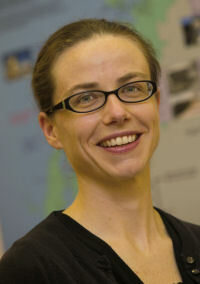 Dr. Lynch’s talk will emphasize that direct field measurements and remote sensing approaches can and should be integrated in a synthetic model of population abundance and distribution that exploits the strengths of each and provides real-time information relevant to both basic research on penguin dynamics and applied questions important for resource management. While this recent paradigm shift in population monitoring has occurred almost exclusively in polar areas (for reasons Dr. Lynch will discuss), the insights gained have broad applicability to other species being monitored over large spatial scales.